Marc Jacobs is launching his own beauty line, Marc Jacobs Beauty. When I got the e-mail from Sephora about this it piqued my interest. The collection preview on Sephora’s website consists of Style Eye-Con No. 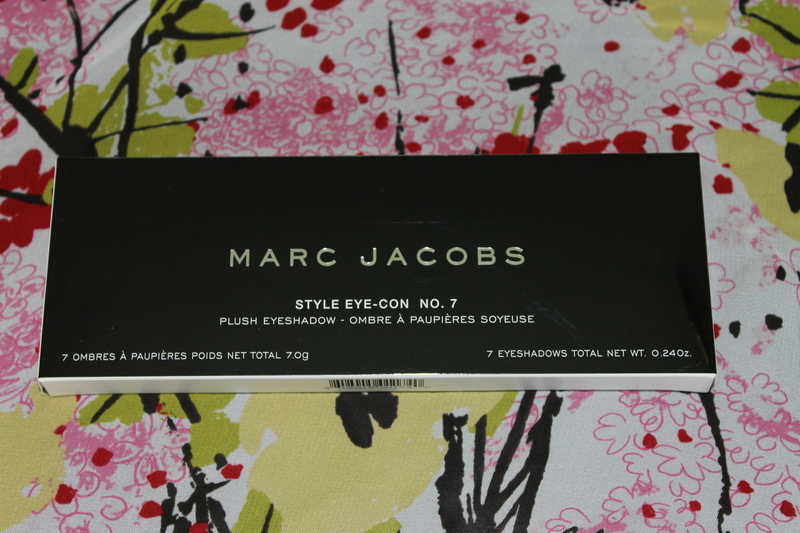 7 Plush Shadow palettes (7 refers to the number of shadows), two Style Eye-Con No. 3 trios, the Lust for Lacquer Lip Vinyl Sheer lipgloss, the Magic Marc’er Precision Eye Pen liquid eye liner, and the Lip Lock Moisture Balm. The full collection will be available August 9 and will include 122 products. I opted for the shadows. The No. 7 palettes are a better value. At $59 you get seven shadows in a range of finishes and .24 oz of product. This comes out to about $8.50/shadow; not a bad deal for a high-end eyeshadow. The No. 3 trios cost $42 for only three shades (though I am unsure of the product weight). For an additional $17 you get four more shades. Also, I was not in love with the choice of shades in the available trios. If you are going to spend money on a high end product, you better love it. The seven shadow palettes preview come in two color ranges: #202 The Tease and #204 The Starlet. Tease is chock-full of with purples and pinky-tones: a purple sheen, matte grayish purple, matte pale pink, iridescent champagne sheen, metallic pastel pink w/gold shimmer, matte bright aubergine, and deep aubergine w/iridescent shimmer. Starlet has a larger range of shades: a metallic muted lilac, metallic champagne pink, metallic dark copper brown, metallic bright copper, metallic gold, metallic bluish silver, and metallic gunmetal gray. 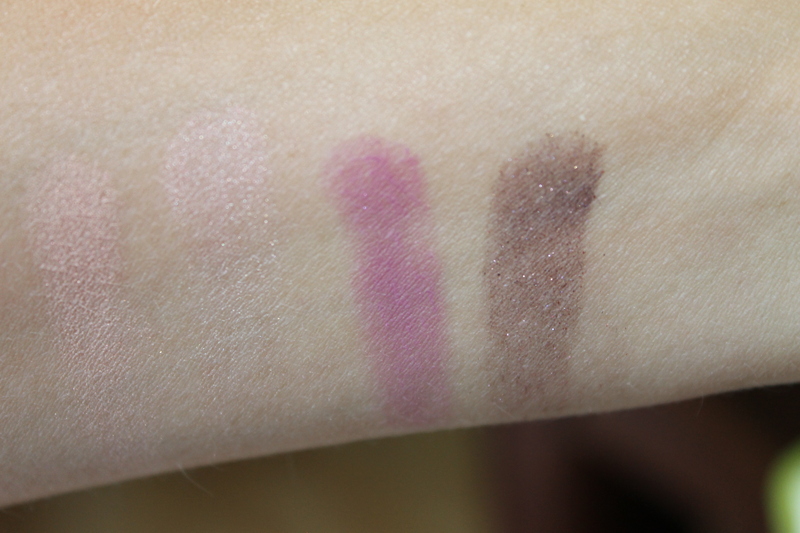 I purchased The Tease (see below for swatches and additional pics). 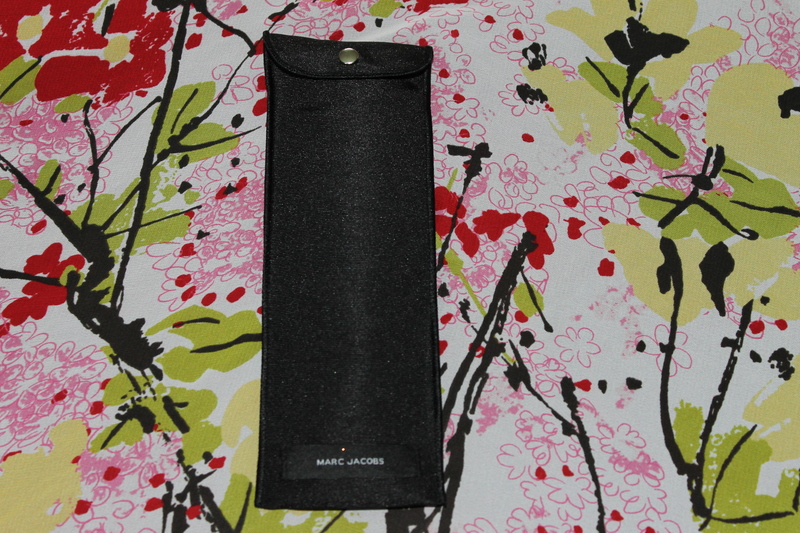 The packaging is very slender, glossy, and lightweight. This would be a great palette to travel with as it is much less bulky than, say, the Urban Decay Naked palettes. This can easily be stored in your purse and has a mirror inside. The downside is that, even though it comes with a fabric protective case, as soon as you touch it there are big time, noticeable fingerprints. This makes it look not so sleek and dirty in a hurry. As for the shadows themselves, overall these are great. The colors are absolutely beautiful. 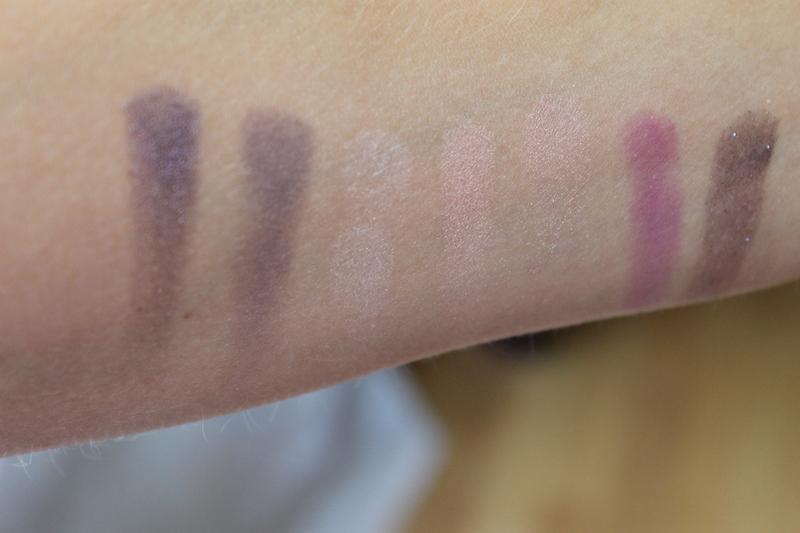 Most of the shades are smooth and easy to blend; the shade #7 is the only one that is gritty. Some have better pigmentation than others. I find numbers 2,3, and 7 need to be built up a bit, but once they are they provide a gorgeous finish. I wish the palette would have included a matte mid-tone brown for blending, but it does offer a couple of matte shades so it is not all shimmer and sheen. 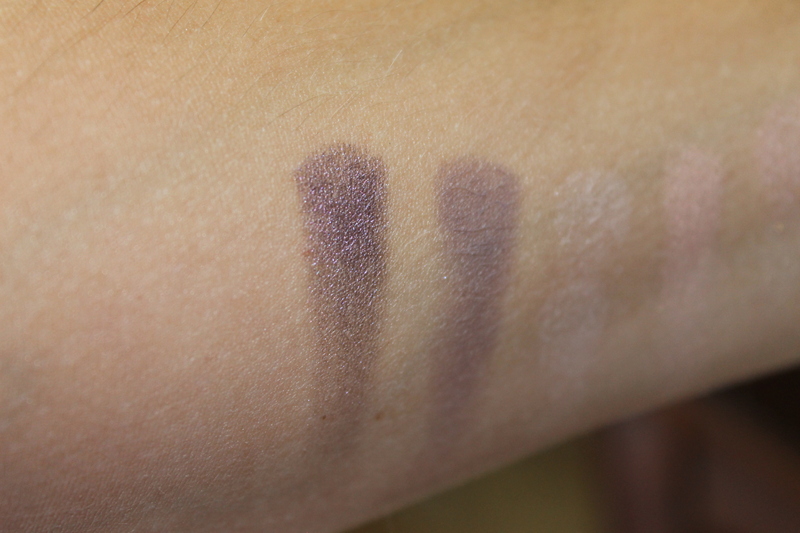 These shadows have great staying power (I’m an oily girl, so that’s saying something!). Is this palette worth picking up? If you are in the market for high-end eyeshadow and could use an easily-blended palette to spice up a neutral collection-sure. While not all high end makeup equals high quality, this definitely is (and it’s certainly more affordable than Dior). Plus purples look great on every eye color. It can be found here. If you already own plenty of decent shadows then I wouldn’t break the bank for it. Remember, at some point it’s just makeup. You don’t need it to be beautiful. 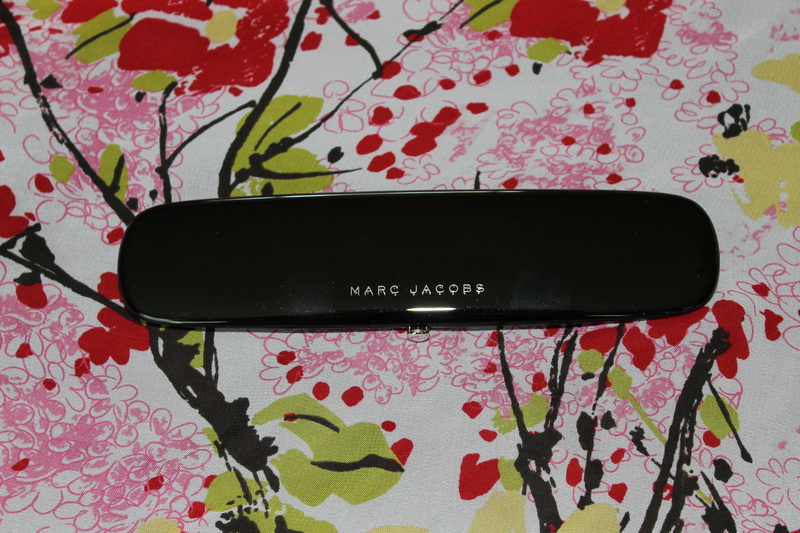 Have you purchased any of the Marc Jacobs Beauty products? Let me know what you got and how you like it in the comments below. Thanks for reading. Posted in Beauty & Style and tagged Beauty, Cosmetics, eye shadow, eyeshadow, first impressions, high end makeup, makeup, Marc Jacobs, marc jacobs beauty, marc jacobs beauty picture, marc jacobs picture, new release, no. 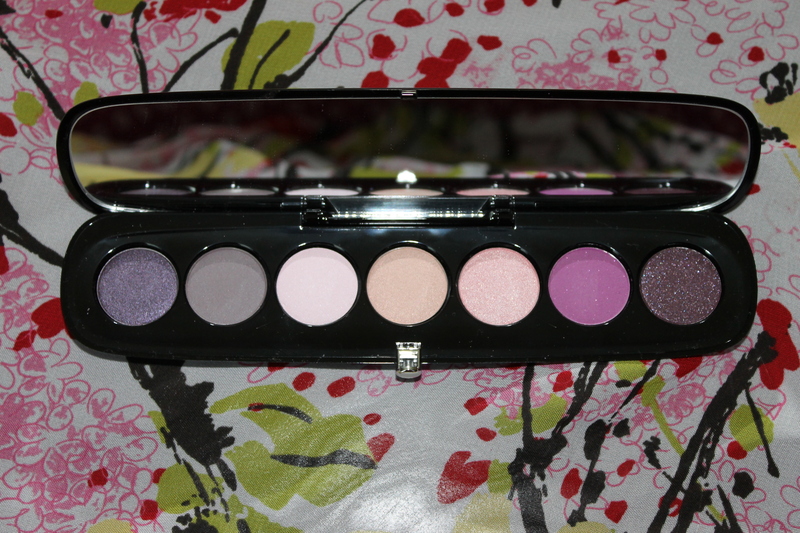 7, number 7, palette, pink eye shadow, pink eyeshadow, purple eye shadow, purple eyeshadow, quality eyeshadow, review, Sephora, somethingtoconsider, somethingtoconsider1, somethingtoconsiderblog, style eye con, swatch, swatches, the tease. Bookmark the permalink. Thank you for mentioning my blog, The Kawaii Closet♥ I’ll try their cosmetics! Of course! I’m really enjoying yr posts.